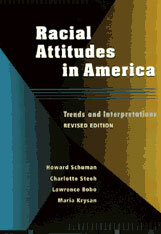 This new edition brings fully up-to-date a book widely praised for its clear and objective presentation of changes in American racial attitudes during the second half of the twentieth century. The book retains the division of racial attitudes into principles of equality, government implementation of those principles, and social distance, but adds questions concerning affirmative action and beliefs about sources of inequality. A conceptual section now opens the book, evidence on social desirability has been added, and a new chapter deals with cohort effects and with the impact of income, education, and gender. In key instances, randomized experiments are introduced that test hypotheses more rigorously than is ordinarily possible with survey data. Throughout, the authors have reconsidered earlier ideas and introduced new thinking.